Lynda's Recipe Box: Got Strawberries? Make Strawberry Yogurt Muffins or Strawberry Rhubarb Cobbler! Got Strawberries? Make Strawberry Yogurt Muffins or Strawberry Rhubarb Cobbler! The strawberries have been so good this season, so thought I'd re post a couple of wonderful recipes using these sweet berries. I posted these delicious Strawberry Yogurt Muffins last year and they are so good. Soft, tender muffins filled with strawberries are perfect with your morning coffee! I've made them often, and they've become one of our favorite muffins! If you like strawberries with rhubarb, you'll love this tasty Strawberry Rhubarb Cobbler with a tender biscuit like topping. Sprinkled with coarse sugar, this dessert is really delicious. Add some whipped cream or a scoop of vanilla ice cream to make it even better! Well, they both look marvelous! I love that strawberry muffin! Look super delicious. My aunt grows rhubarb and turns it into strawberry rhubarb pie and I love it. Yours looks delicious. Both sing to me - the MN rhubarb is on and the strawberries don't come till Juune - but the ones in the stores are finally red and juicy and filled with sweet taste. So pretty for spring. Love strawberries and yogurt for breakfast - so know I would love the muffins. Both recipes looks delicious. I love starting the day off with a tasty muffin and strawberries and rhubarb are one of my favorite fruit combinations. Thanks for two yummy recipies,Linda. I'm looking forward to trying both of them. You are right, the strawberries have been very plentiful and delicious this season. The muffins looks delicious. I love a couple of muffins in the morning with my coffee or any other time becasue they taste so good. I like rhubarb too. I have never prepared it myself but, have always enjoyed it in pie. i love this time of year since strawberries are coming out of our ears--muffins, cakes, breads, ice cream, i'll devour 'em all. this is the first cobbler i think i've seen, and it's lovely! Two terrific ideas! I think I'll make strawberry muffins tomorrow morning! Georgous strawberry yoghurt muffins,..ooh boy, they do look so tasty & superb even! 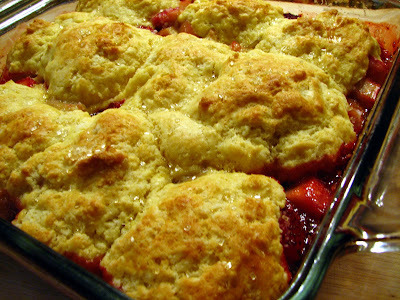 And your rhubarb & strawberry cobbler does look so tasty & fantastic too! Side Dishes for Easter Dinner!